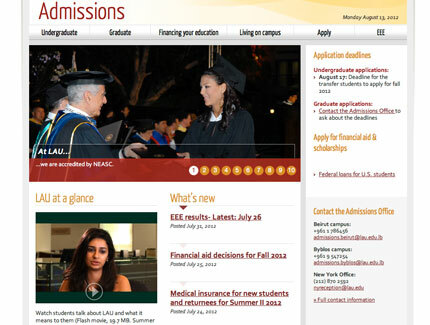 The LAU homepage and the Admissions website win awards in the Pan Arab Web Awards competition. The Admisions website wins gold. Click on any photo above for larger version. Out of a total of 450 registered submissions, the LAU homepage and the LAU Admissions website won the silver and gold prizes, respectively, in the 8th Pan Arab Web Awards (PAWA) competition, under the Education category. The PAWA is a competition targeted toward web and business developers, aiming to promote – and raise the standards of – websites in the Arab region, foster a sense of innovation among web designers and developers, and encourage various sectors in the Arab world to be involved in e-services and digital economy. “This is a signal win, and I am very proud of the copious efforts of the various teams that led to this great achievement,” says LAU President Dr. Joseph G. Jabbra. Judging criteria for PAWA was based on concept, content, creativity, visual design, ease of navigation, and interactivity. 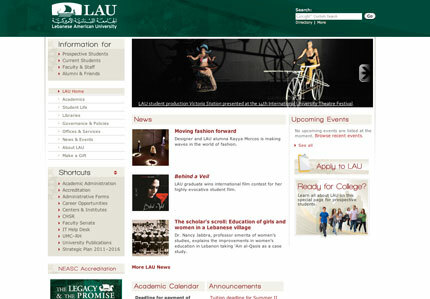 Indeed, “Enhancing usability and improving the visual aspect of the LAU homepage were some of the main objectives when the website was undergoing major revamping and redesign back in 2008,” says Karina Rodriguez, associate director of the Marketing and Communications (MarCom) department, who managed the team behind the project. The 2008 overhaul was the fruit of the collaboration between MarCom and the Student Development and Enrollment Management (SDEM) office, giving the homepage a completely new look. Consequently, a slideshow, a list of upcoming events, and a section for prospective students were added, among others. “The new student webpages are geared to students’ needs and provide quick and clear answers, helping students navigate through the complex university application process,” explains Dr. Elise Salem, vice president for SDEM. In other words, “We tried to put ourselves in the shoes of high school students visiting the Admissions page, in order to see how we can make it easier for them to navigate it,” expounds Zoya Zahabi, senior executive assistant at the SDEM office. In fact, SDEM periodically draws up brainstorming sessions with high school students in order to evaluate the Admissions website from the perspective of future students, and find ways to improve and update it to optimize user-friendliness. “Getting to know your audience and speaking their language, while echoing the voice of your institution, lies at the very core of the website development process,” maintains Peggy Hanna, assistant vice president for MarCom. “This award is very important for us because it is a public recognition of MarCom and SDEM’s great efforts and hard work – not only locally, but regionally as well,” she says.